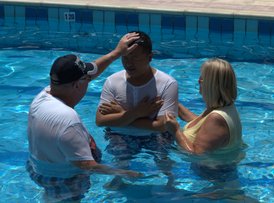 Our Elders, Alan Longstaff (now retired) & Val Morgan, had the opportunity to baptise a lovely young Chinese couple, Emily Shi and Stone Zhang, at the Coral Star swimming pool. 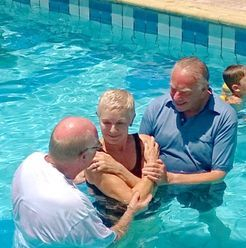 It was with great joy that two of our congregation, Brian and Pauline Shubrook, decided to be baptised in the swimming pool at the Petsas Apartment complex (Coral Star). 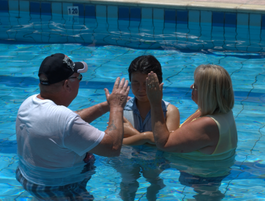 The baptism was undertaken by our two Elders, Val Morgan and Alan Longstaff. 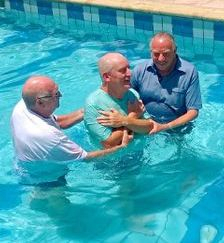 This was Alan's last baptism as an Elder of NTCC - he and his wife have now returned to the UK. 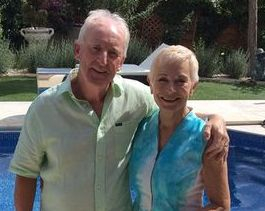 Many people turned out to witness these two events and of course, in a public area of the apartments, we never know the far-reaching effect it could have on holiday makers! All seeking baptism should, in the first instance, contact one of the Elders.